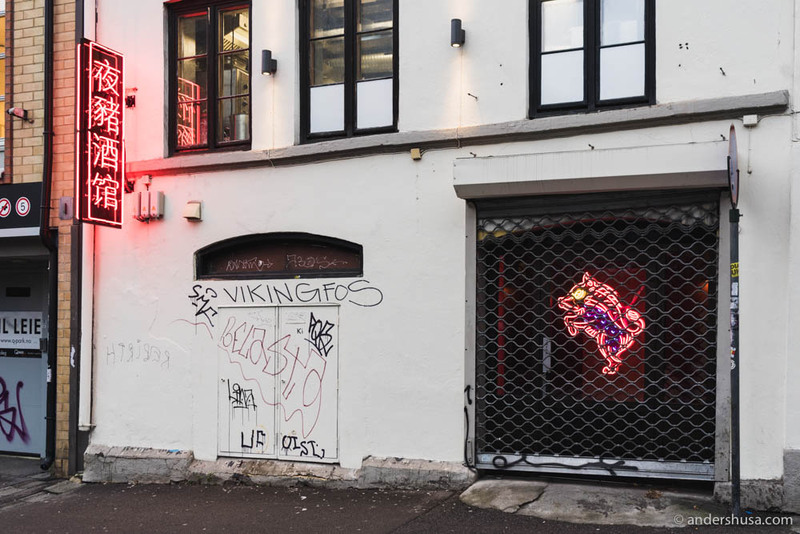 Night Pig is an exciting new izakaya in Oslo. 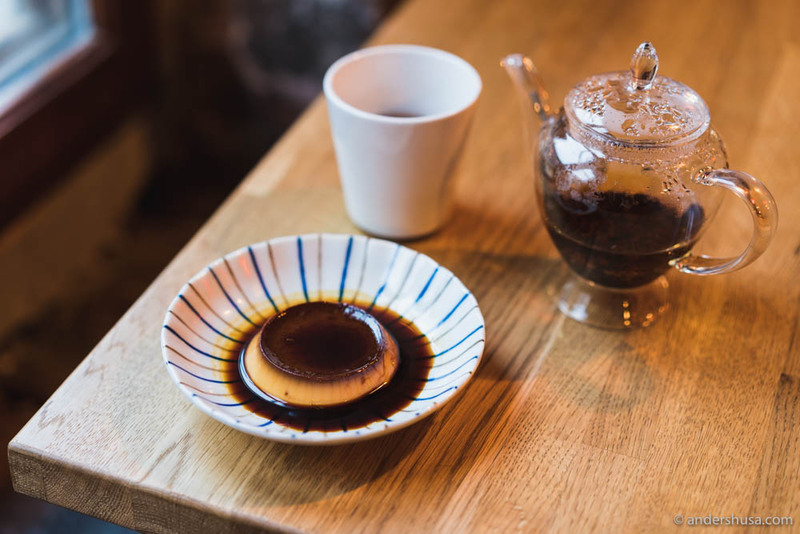 There are not a lot of informal Japanese sake bars and gastropubs in Scandinavia, but more and more have started to pop up in the last couple of years. 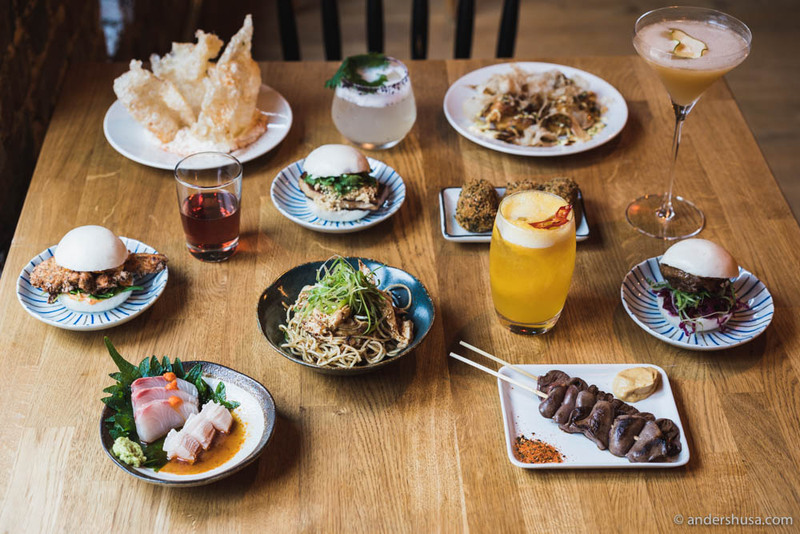 I like Jah Izakaya & Sake Bar in Copenhagen, in particular, and in Oslo, there’s a place that’s simply called Izakaya which has been around for years already. 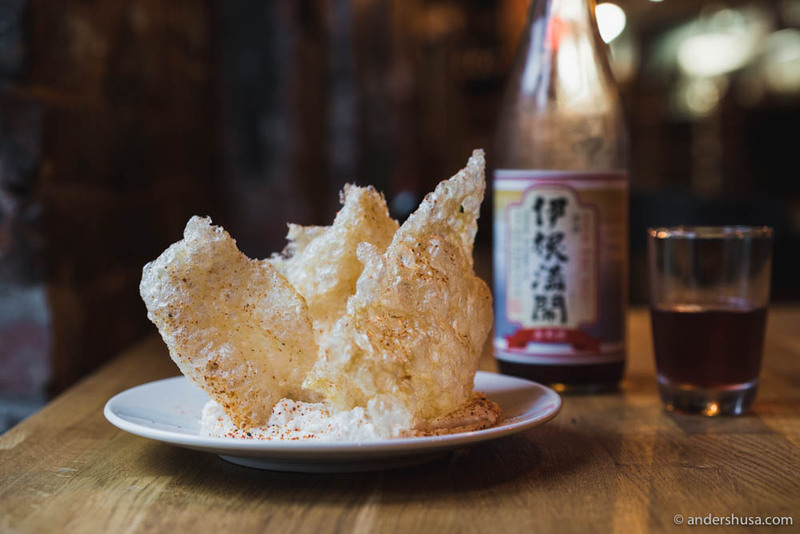 This time, it’s the guys behind Koie Ramen, Way Down South, and Gressholmen Kro, The Core Restaurant Group, who has ventured into the late-night eatery genre. 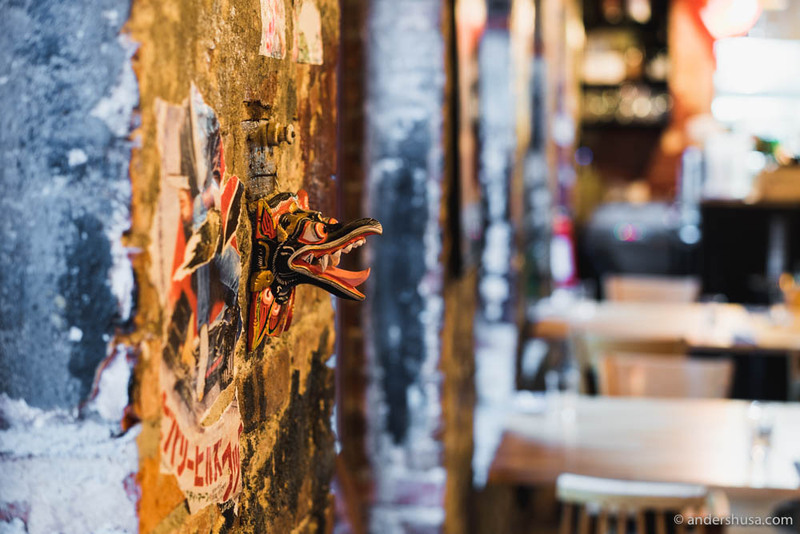 Although, Night Pig is only open Tuesdays to Saturdays from 5 PM to midnight, with the bar open until 1 AM. I wish a place called Night Pig would serve food a bit longer than this. At least, they could join the likes of Katla and Arakataka who has food service until 1.30 AM and 1 AM respectively on certain days of the week. 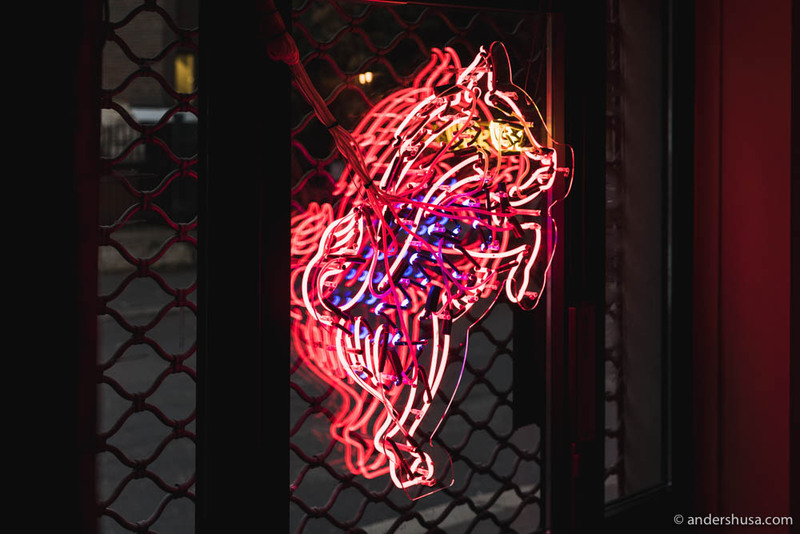 To locate Night Pig, look for a bright neon sign with Japanese letters on Bernt Ankers gate – a side street to Torggata that runs parallel to where Koie Ramen is situated. As you get closer, you will also spot a neon pig behind steel gates. The entrance is only a few steps away. 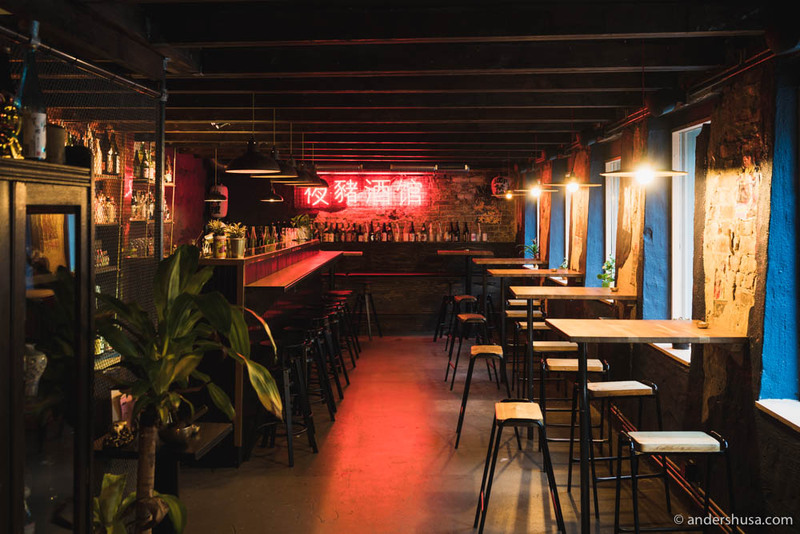 At the ground level, you enter the bar area, which is a no-reservation zone where you can go just for drinks – but also to order freely from the food menu. Upstairs, is a more traditional sit-down area that accepts reservations. I’ll definitely prefer the bar area for my future visits. It is probably the closest you can get to the old Pjoltergeist atmosphere. The bar downstairs is a drop-in zone. No bookings here! 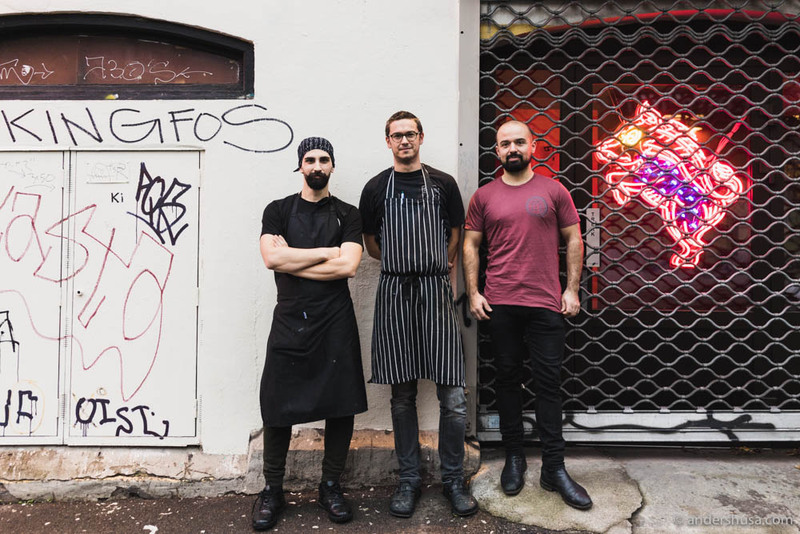 The head chef at Night Pig is João Costa, whom I actually interviewed two years ago for a story on Paleet (article in Norwegian) when he worked at restaurant Sabaki. Tim Homer is the executive chef and also co-owner together with Ann Sung-an Lee, while James O’Donnell runs the front of house. Due to very poor restaurant lighting in the evening, I asked to come back to Night Pig for a photo shoot during the day. That meant I also had a chance to sit down for a talk with Tim. His background is from the acclaimed restaurant Nobu in London, as well as the equally well-known St. John. He also worked for Zuma in Istanbul, but four years ago he came to Oslo looking for work. Soon after, Tim met Ann, who shared his dream about opening a ramen shop. In preparation for Koie Ramen, Tim learned how to make proper ramen from the Japanese. – All the top ramen chefs work with Yamato. They even taught Ivan Orkin in New York, Tim explained to me. Yamato is the leading producer of ramen noodle machines, I learn. They also have their own ramen school, where they teach all the secrets of ramen making, from broth to noodles, sauces, and plating. 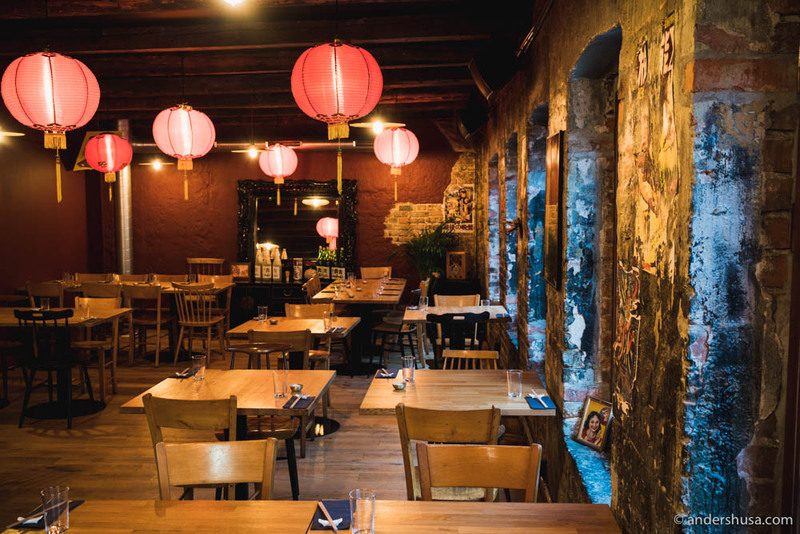 Night Pig’s menu will change often and seasonally since it’s ingredient-led. 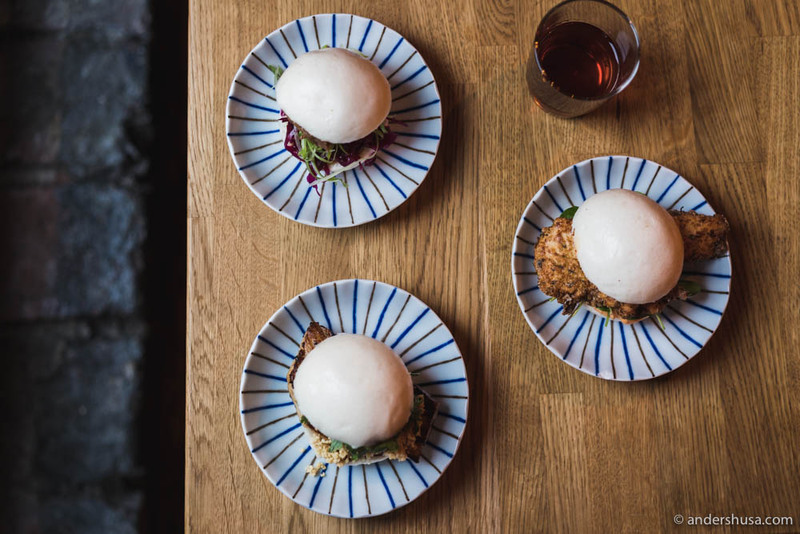 Some of my favorite dishes on the current menu includes the duck hearts, pollock fritters, korokke (Japanese croquettes), chicken sansho noodles, hamachi sashimi, as well as the different baos (pork belly, chicken Karaage, and confit duck). 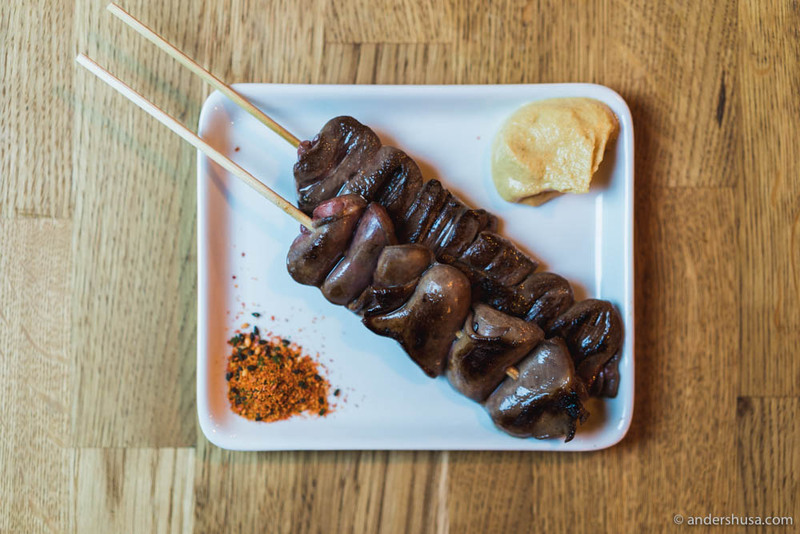 The duck hearts are yakitori-grilled and served with a hot Japanese karashi mustard and shichimi spice. That mustard burns even more than wasabi in the nose! 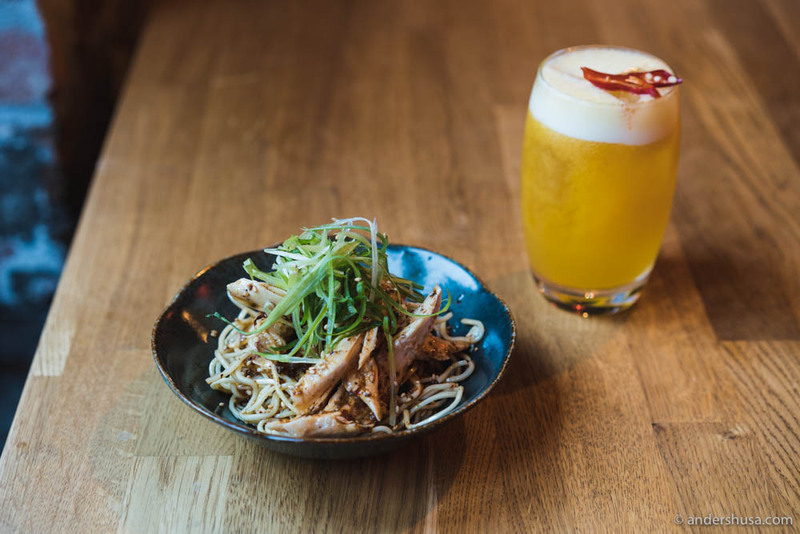 The chicken for the sansho dish is poached in chicken stock and served cold with the noddles all dressed in a mixture of schezuan pepper, garlic, rice wine vinegar, and chili oil. A delicious, numbing sting! 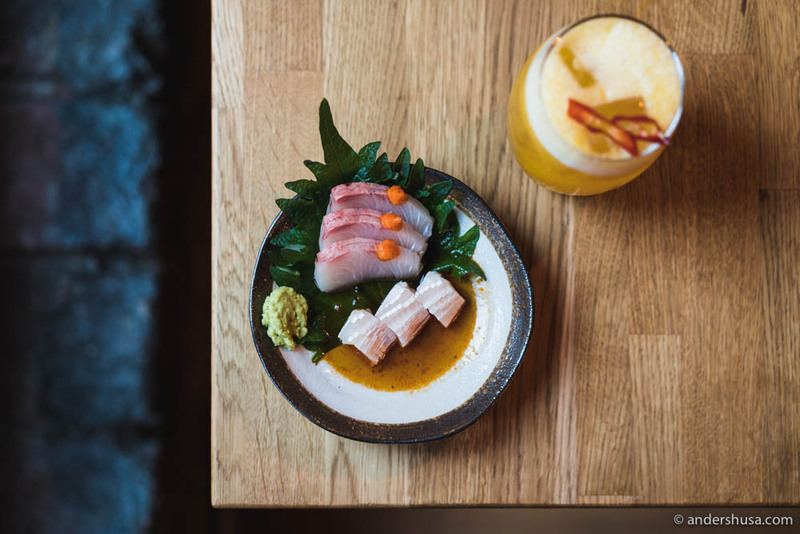 The hamachi sashimi is accompanied by an orange koscho and ponzu sauce. On my first visit a few weeks back, this dish was instead mackerel sashimi with a gooseberry dip and I actually liked that even more. Baos at Night Pig are house-made, which is quite rare since the store-bought ones are rather cheap and actually quite decent. You really can taste the difference, though. Unfortunately, the buns were slightly too dense for my liking. According to Tim, it’s a temporary issue which they will sort. I hope so because there’s certainly nothing wrong with the fillings. Classic pork belly, Taiwanese-style, with hoisin sauce, peanuts, and coriander is dangerously addictive. I love the chicken Karaage too, which comes with kimchi mayo. 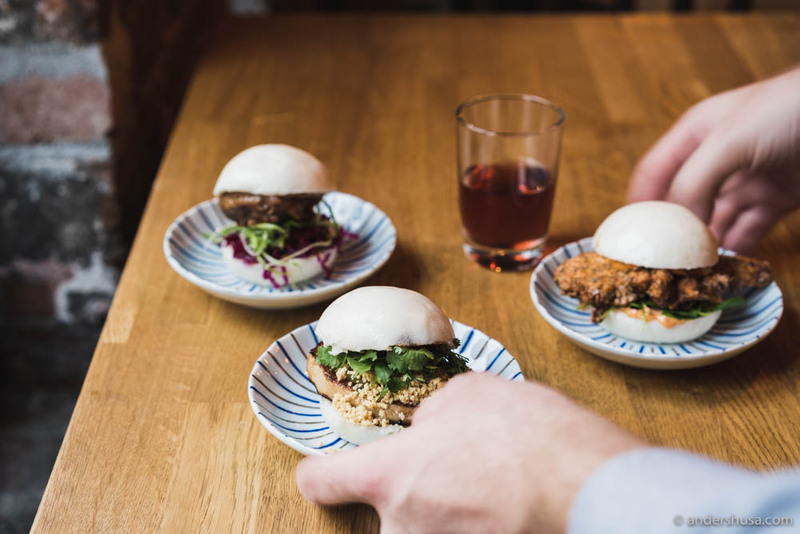 The confit duck bao taste just like a crispy duck dish, with a mix of miso and hoisin sauce with five spice honey, pickled red cabbage, and spring onions. I ordered all the baos! Pork belly bao with hoisin sauce, peanuts, and coriander. Chicken Karaage bao with kimchi mayo. Confit duck bao with miso and hoisin sauce, pickled red cabbage and spring onions. Sake, like most good things in this world, is an acquired taste. However, the last two to three years, I have really started to enjoy it more and more. Especially when you’re served the good stuff, which James O’Donnell at Night Pig makes sure to have in stock. His cocktails are flavorful too, which is important considering the menu doesn’t have too many interesting wines. But with all this delicious food and sake, I can imagine the bar downstairs will become a popular pitstop on our late nights out in Oslo. Especially, if they prolong the opening hours! Purin – a Japanese crème caramel / custard pudding. 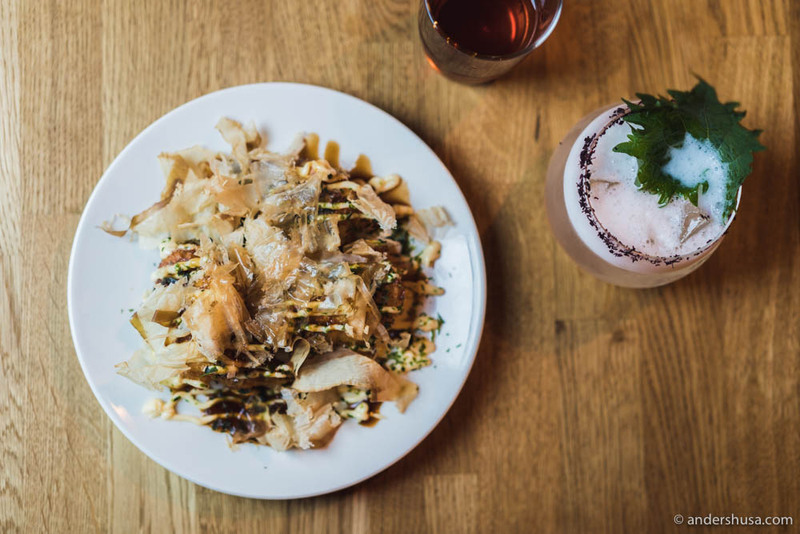 What’s your favorite izakaya dish? Please share in a comment below.